1 The sun came up. Mother Dog fed her little dog. His name was Purple. Then his mother gave him a dime. She sent him to the store to buy a kite. 2 Purple met a red frog at the store. They stopped to chat. 3 "What are you doing today?" asked the red frog. 4 "I am here to buy a kite," said Purple. 5 "That sounds like fun," said the frog. "Will you buy a purple kite?" 6 Purple shook his head. "No. I like yellow. 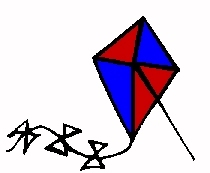 My kite will be as yellow as a lemon." 7 They went into the store. There were many kites. Purple did not see any yellow ones. He felt sad. 8 Just then, Purple Dog saw a yellow kite! Red Frog saw it, too. He tried to grab it. 9 "Hey," yelled Purple. "You took my kite!"